All dates are correct at time of posting. Please check that there have been no changes before travelling. Come and Join us at the next event we are attending !! your event, then please get in touch with our event organizer - Dave East, who will galdly assist you. 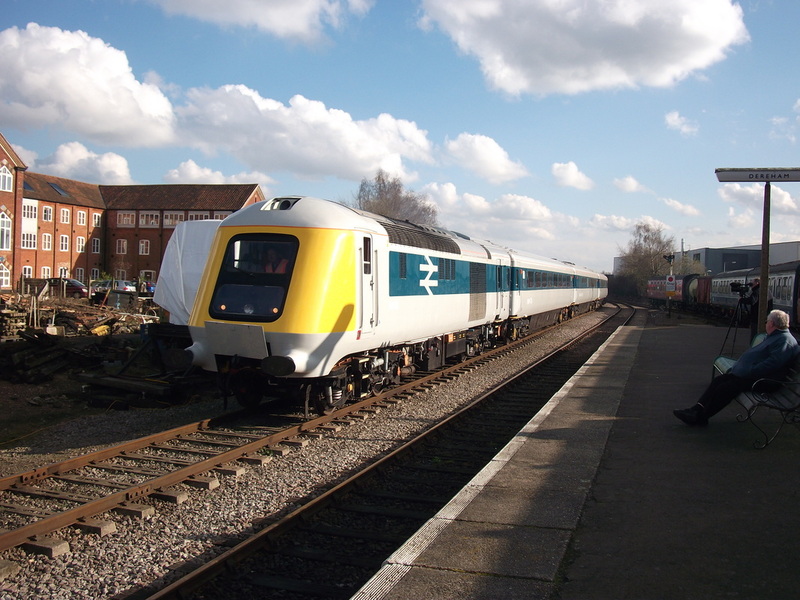 This year the Railway had managed to arrange a visit from the prototype HST power car and 3 matching MK3 coaches. Funny how preservation moves on! ​ but also for the Society with many questions about the Society, 1753 and the up & coming Finmere event. Thanks to Ian Shepherd, William Riddihough, Rob Bray and John Zabernik for their help at this event. 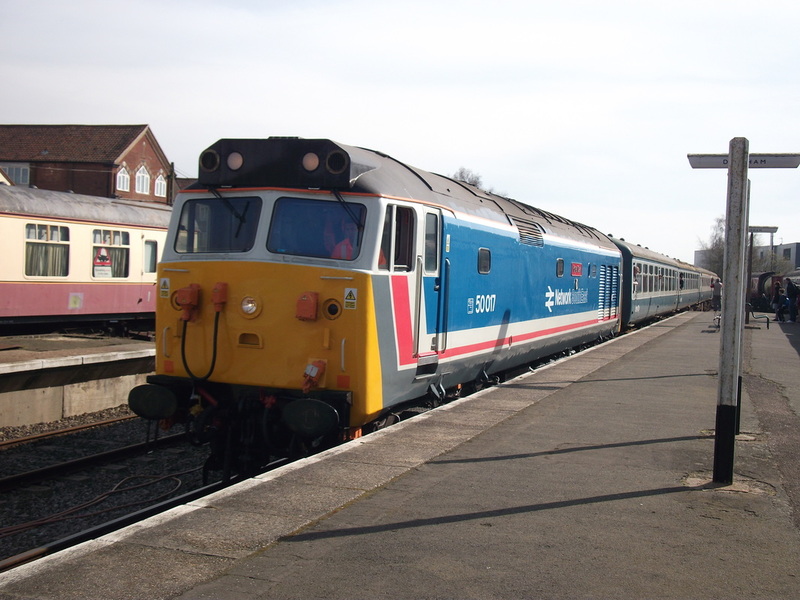 ​some class 56 diesels a different class 50 and a couple of class 47’s. 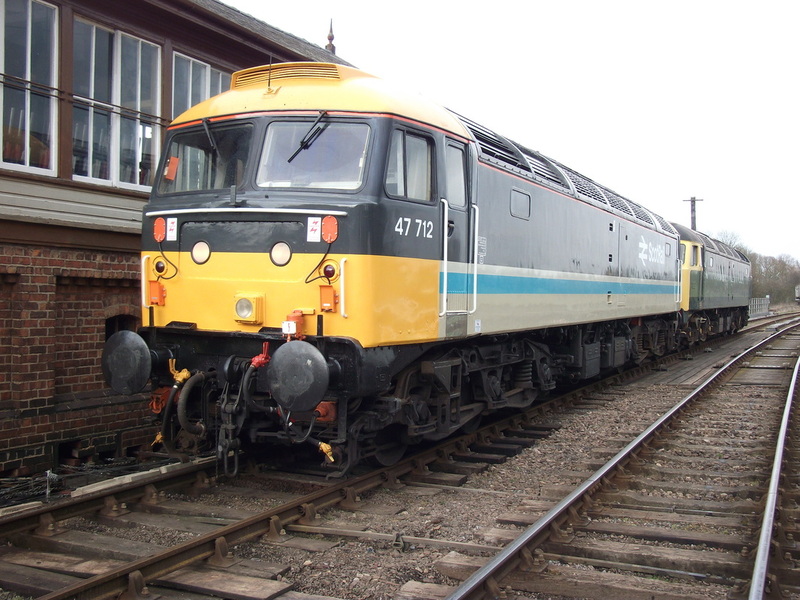 One of these being 47 712 of which we produced a mug and members of the group came up and cleared us out of stock! The weekend was a resounding success and once again we did excellent trade and picked up new members. Thanks to John Shepherd, Stan Collett, Rob Bray and John Zabernik for their help at this event. 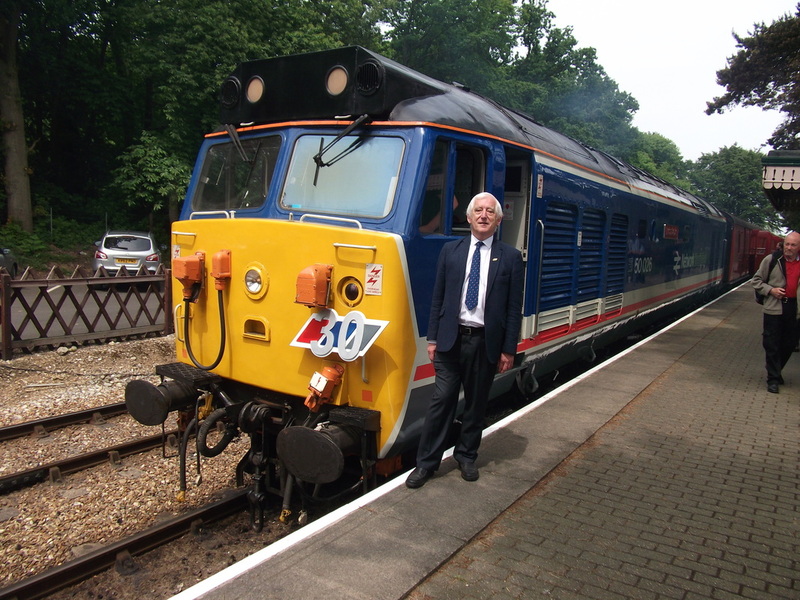 John Piper and Ian Shepherd set the stall at the Bluebell diesel gala on the 15th - 17th April 2016. 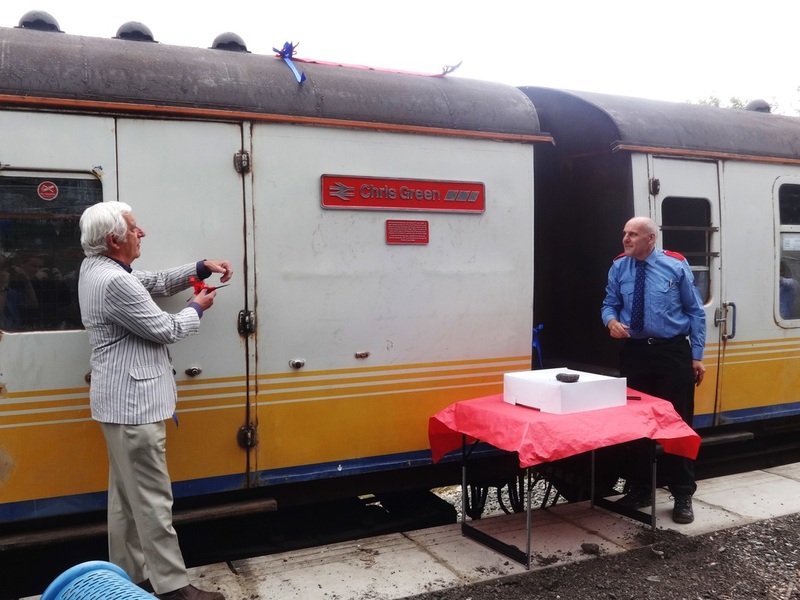 The event was arranged to mark 15 years of GB Railfreight and a selection of GBRf traction was in operations and once again a steady stream of visitors to the stall made a most successful weekend despite some dodgy weather. Thanks to Chris Reavell for his help at this event. 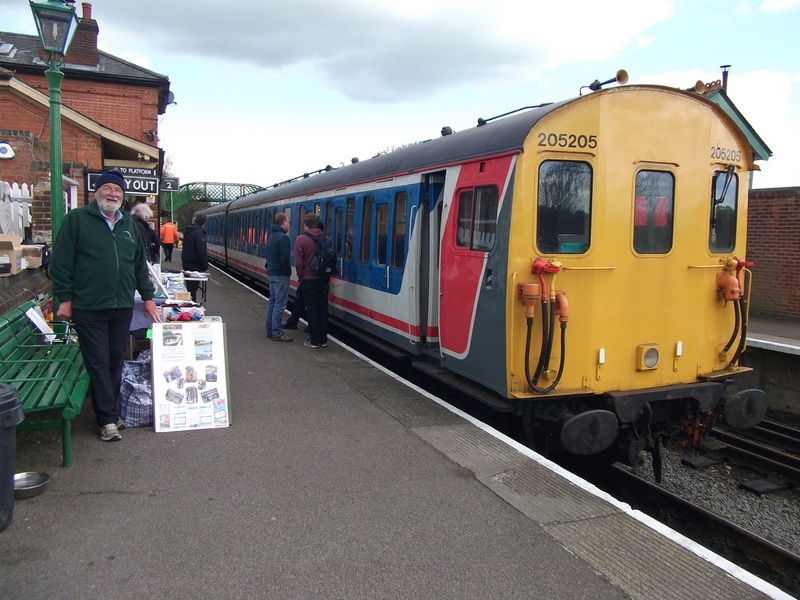 Off to the Epping & Ongar spring diesel gala on Saturday the 23rd April 2016 we went! Due to other commitments over the weekend Dave East and John Shepherd were only able to attend on the Saturday. 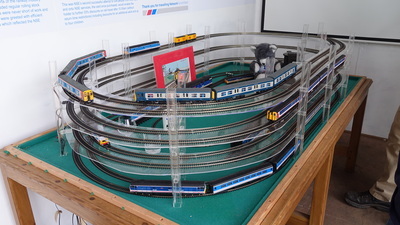 The railway put on another good show with both their home fleet and a couple of visitors. 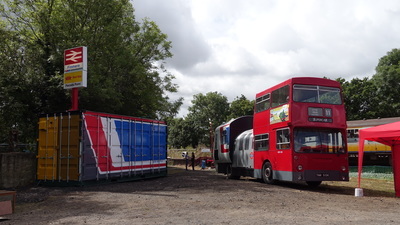 This coupled with the usual heritage bus action on the connecting bus service made a most enjoyable event. Report by Dave East. Photos as credited. 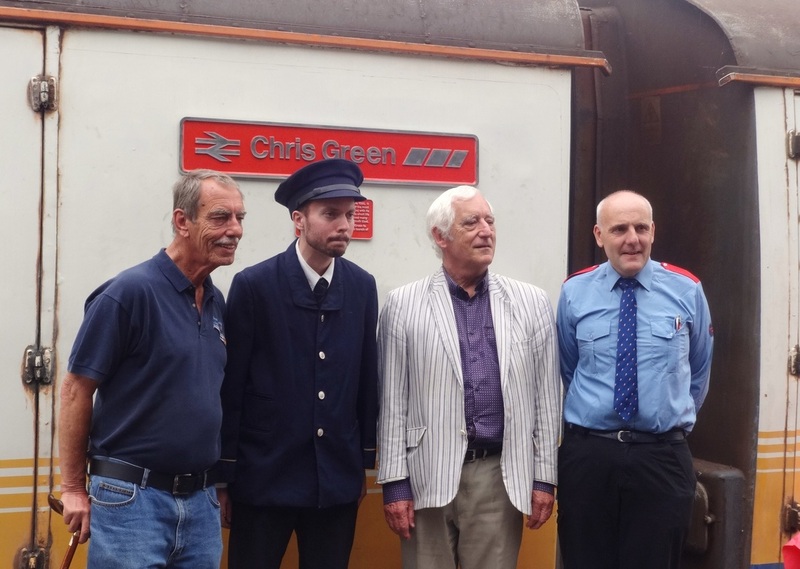 Chris Green at Weybourne Station. Photo by Dave East. 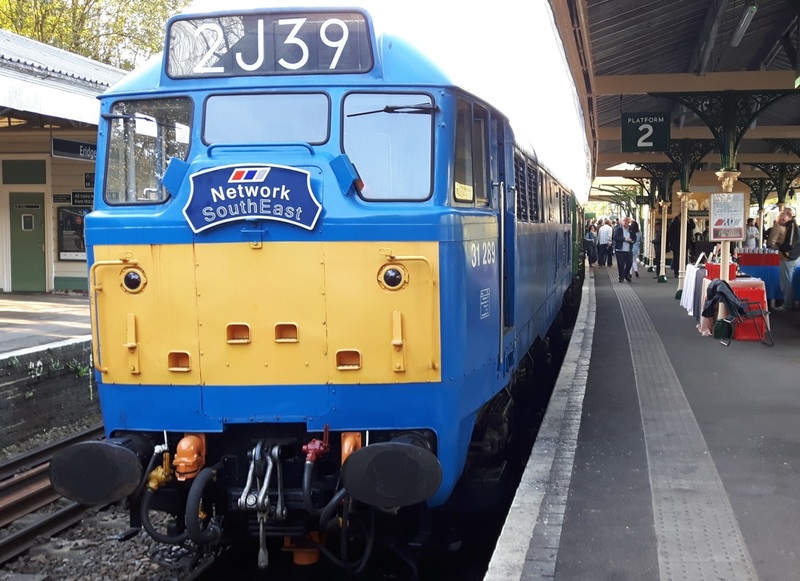 Over the weekend of 10 – 12 June the North Norfolk railway in conjunction with The Network SouthEast Railway Society celebrated 30 years since the launch of Network SouthEast during the Railways Diesel gala. 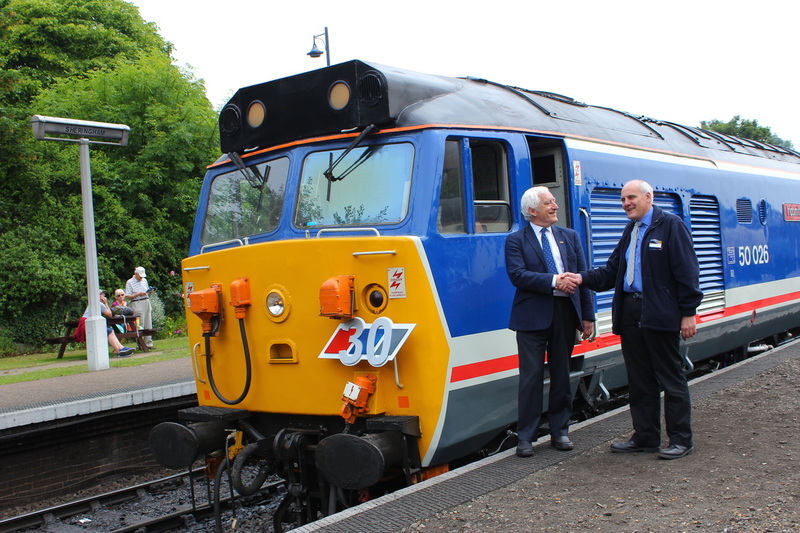 Chris Green and Dave East with Class 50 026. Photo by Adam Head. 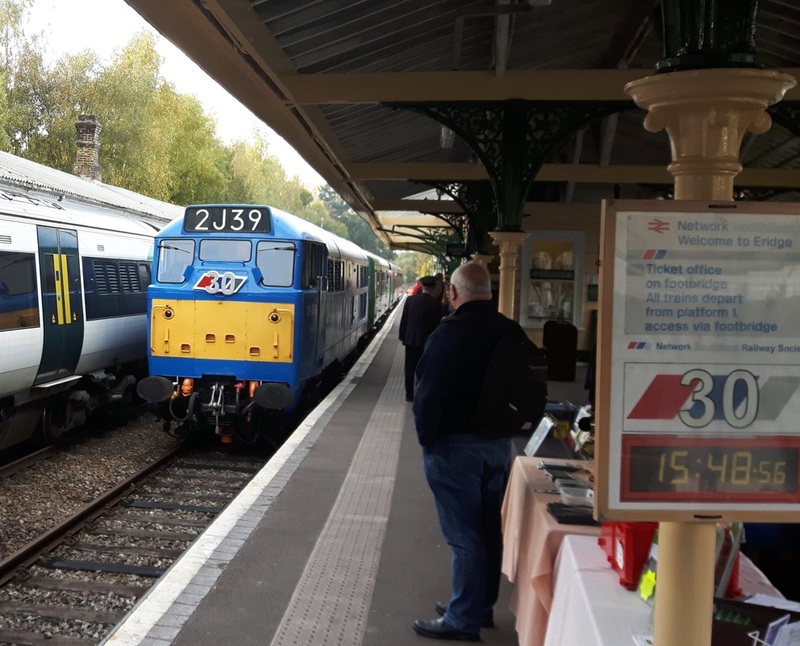 Each Station carried an NSE running in board and during the weekend several trains carried special headboards The Network SouthEast Railway had made for the event. 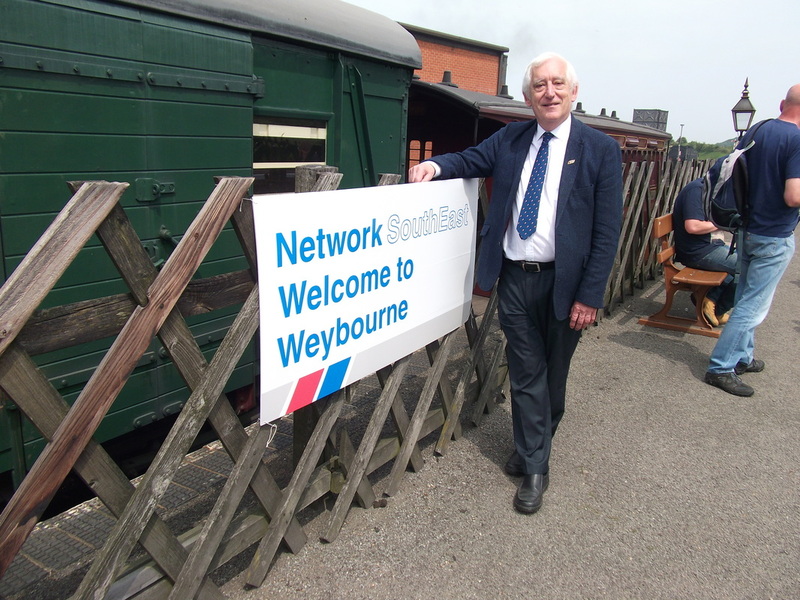 on hand at Weybourne to sign copies of his book “The Network SouthEast Story”. 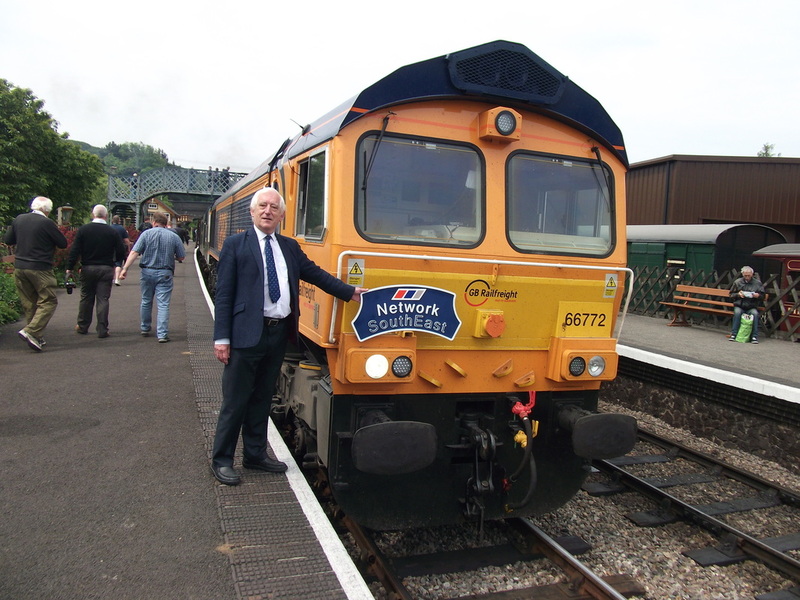 Chris Green with Class 66 772. Photo by Dave East. 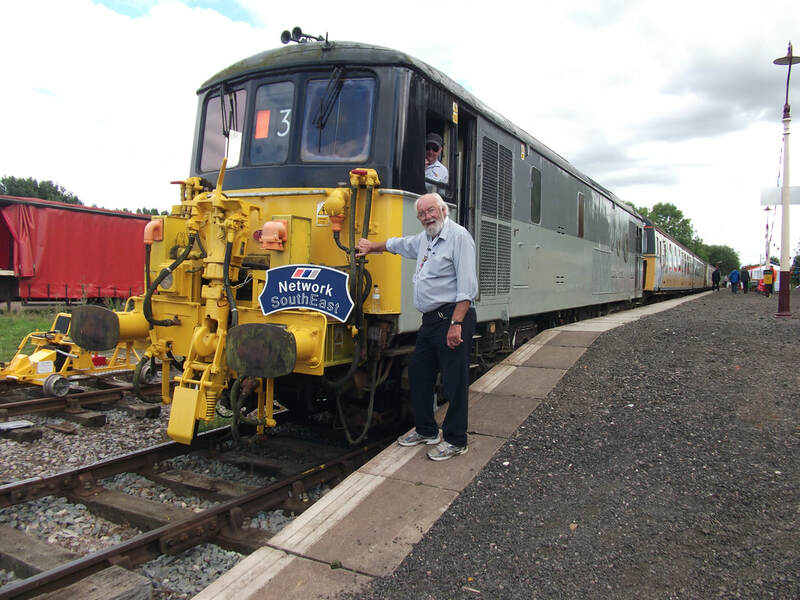 Chris Green with Class 50 026. Photo by Dave East. 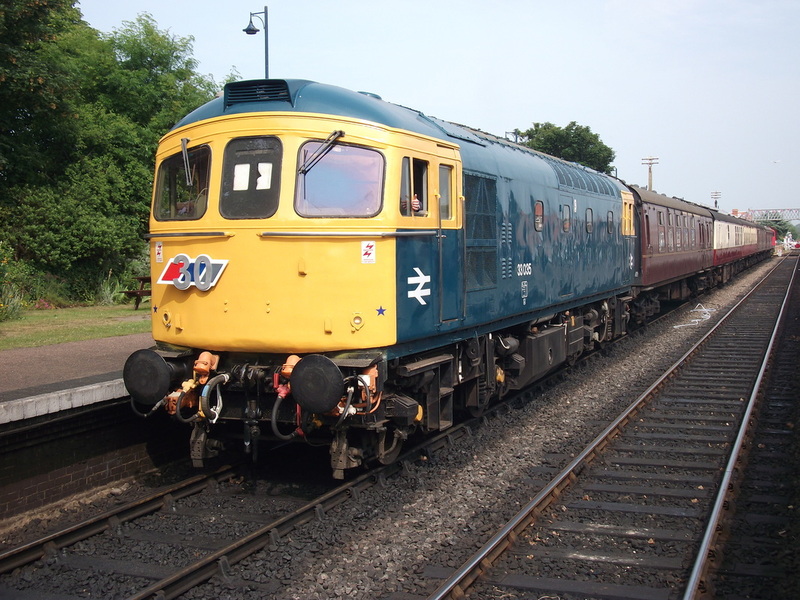 Class 33 035 with 'NSE 30' headboard. Photo by Dave East. 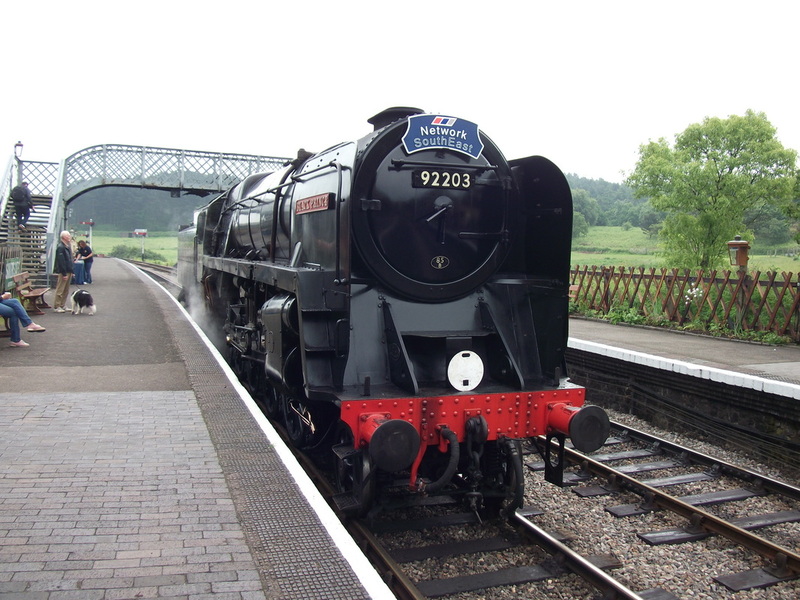 92203 with 'Network SouthEast' headboard. Photo by Dave East. all the hard work and effort in bringing it all together. 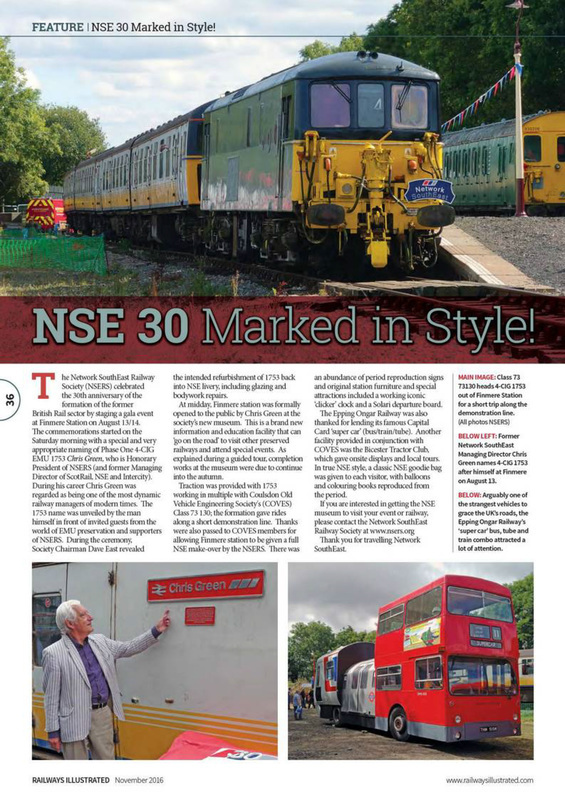 NSE 30 IN TRUE NETWORK STYLE! 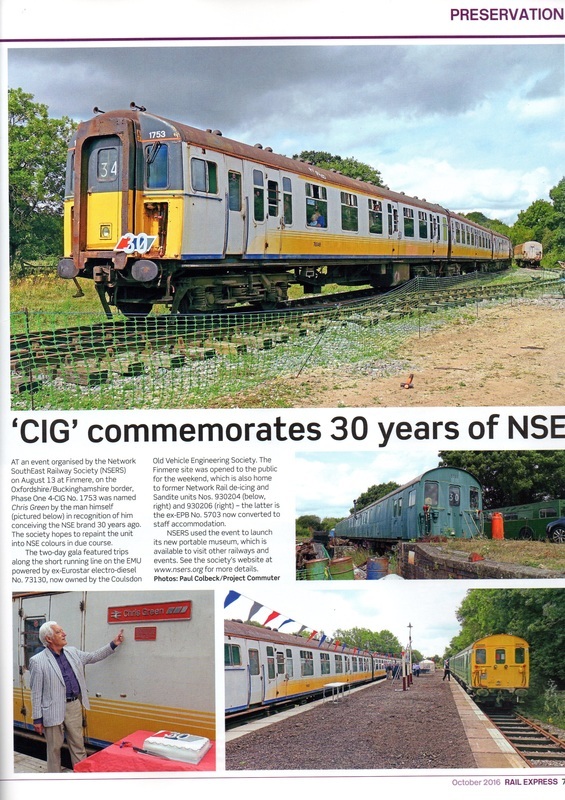 event at Finmere Station to celebrate the 30th anniversary of NSE. Celebrations started on the Saturday morning with a special & very appropriate naming of our Phase One 4CIG 1753 “Chris Green” - Hon President of NSERS. - (Managing Director of Scotrail, NSE & Intercity) during his career, Chris Green has been quoted as being one of the most dynamic railway managers in modern times. 1753 name was unveiled by the man himself in front of invited guests from the world of EMU preservation and supporters of NSERS. 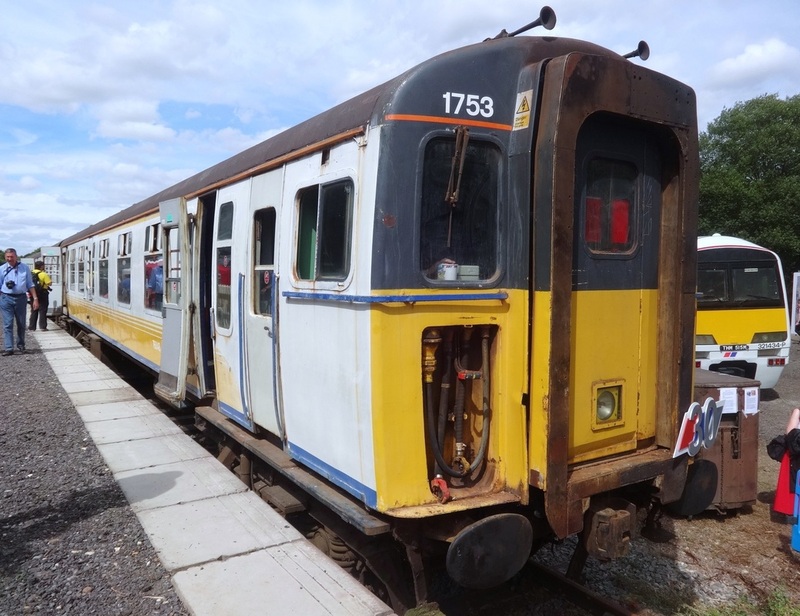 During the naming ceremony, society chairman Dave East revealed the intended refurbishment of 1753 back into NSE livery including glazing & bodywork repairs. 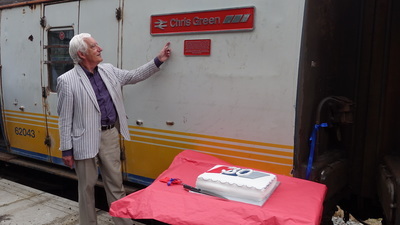 Chris Green & Dave East seconds after 'Chris' cuts the ribon to reveal the nameplate. Chris Reavell. Chris Osman, Alex Forbes, Chris Green and Dave East. (Photo: C Reavell). 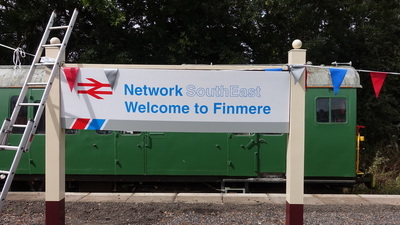 At 1200 midday, Finmere station was formally opened to the public by Chris Green via the Network SouthEast Railway Society’s new museum. 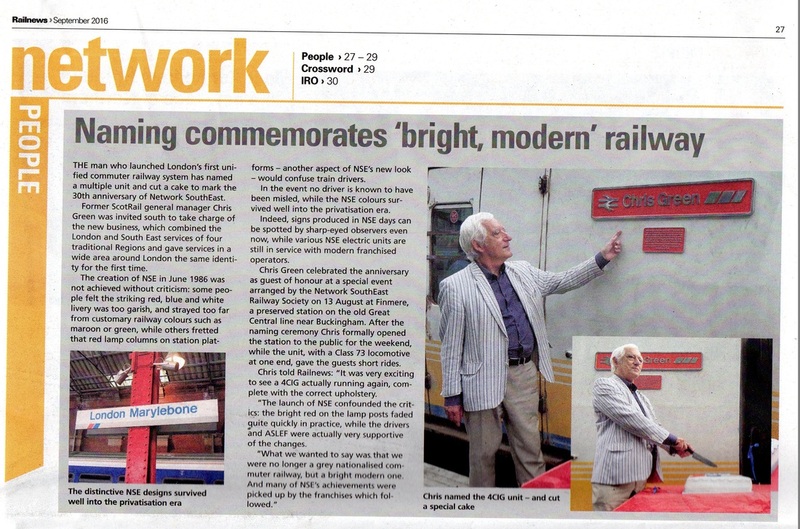 This is a brand new information and education facility that can visit other preserved railways and special events. The museum was unveiled at Finmere as part of the event & as explained during the guided tour, completion works would be undertaken over the next few weeks. 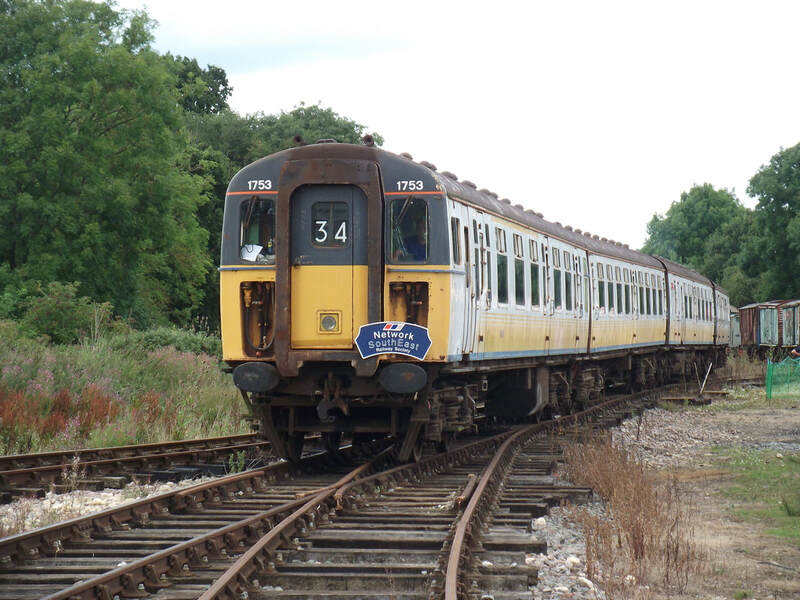 Traction was provided with 1753 working in multiple with Coulsdon Old Vehicle Engineering Societys class 73 130, they gave rides along a short demonstration line. 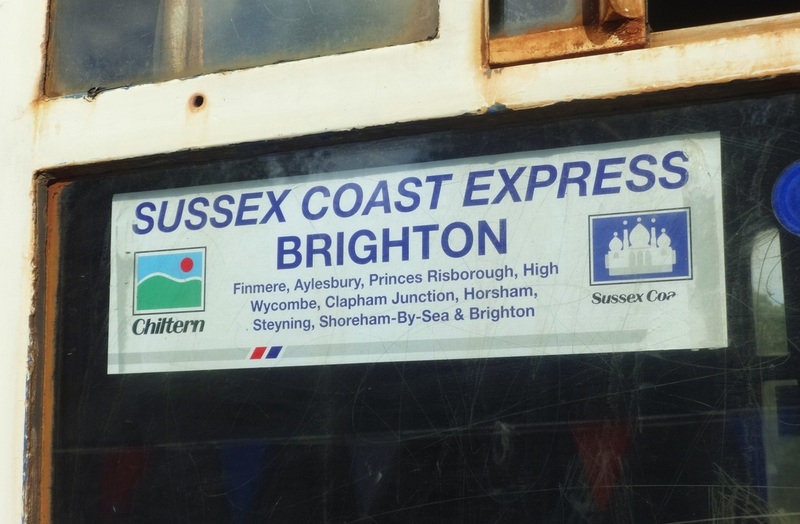 A nice touch was the NSE style window labels we had produced showing a pre-grouping route from Finmere to Brighton. 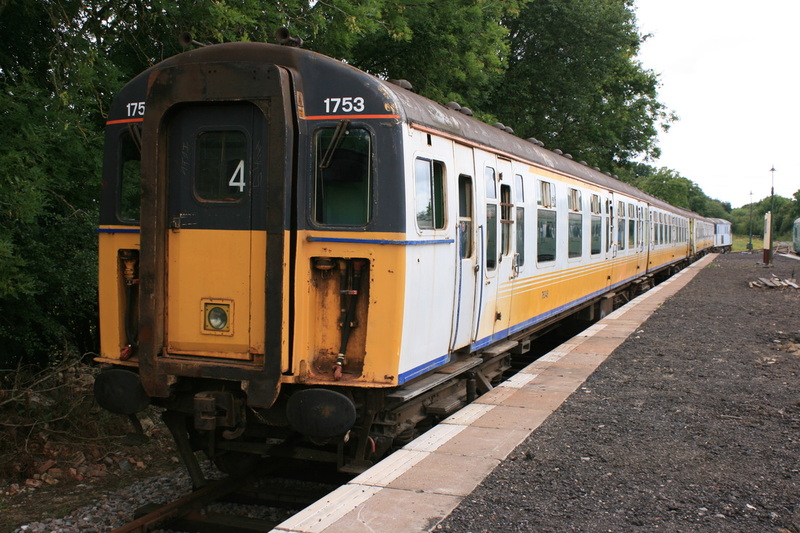 1753 with NSE30 nameplate & 'Supercar' in background. Chris Reavell. Special commemorative window labels designed for the event. Chris Reavell. 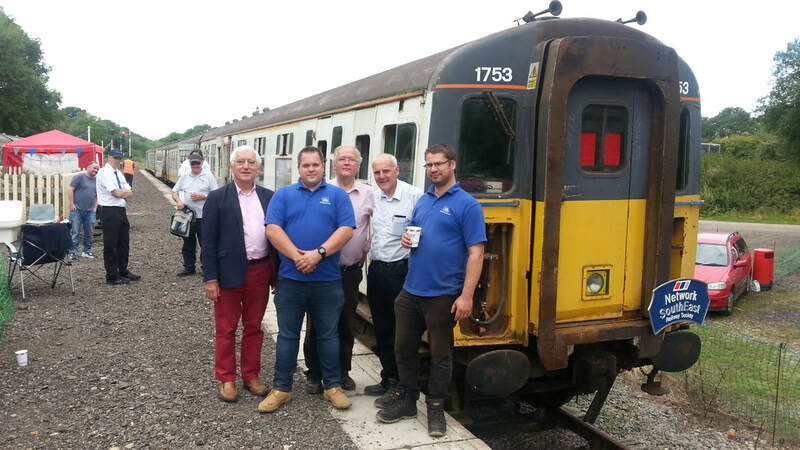 Special thanks must go to COVES members for allowing Finmere station to be given a full NSE make over by NSERS. 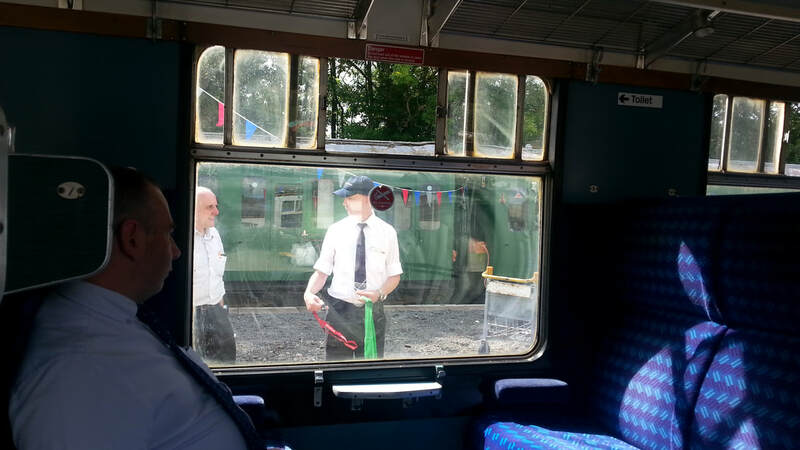 Period reproduction signs and original station furniture were in abundance with special attractions such as working iconic “clicker” clock and Solari departure board plus lots of bunting! 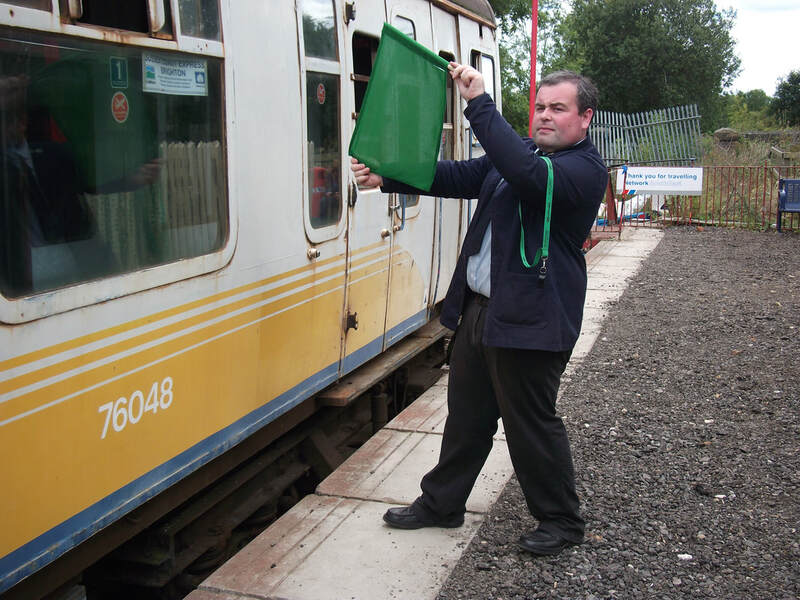 Thanks to the Epping & Ongar Railway, for lending their famous Capital Card “super car” (bus tube train). onsite displays & local tours. with balloons & colouring books reproduced from the time! container and other countless Projects. who look an amazing array photographs throughout. Report & photos by John Piper. jointly organised with the West Kent CAMRA branch. 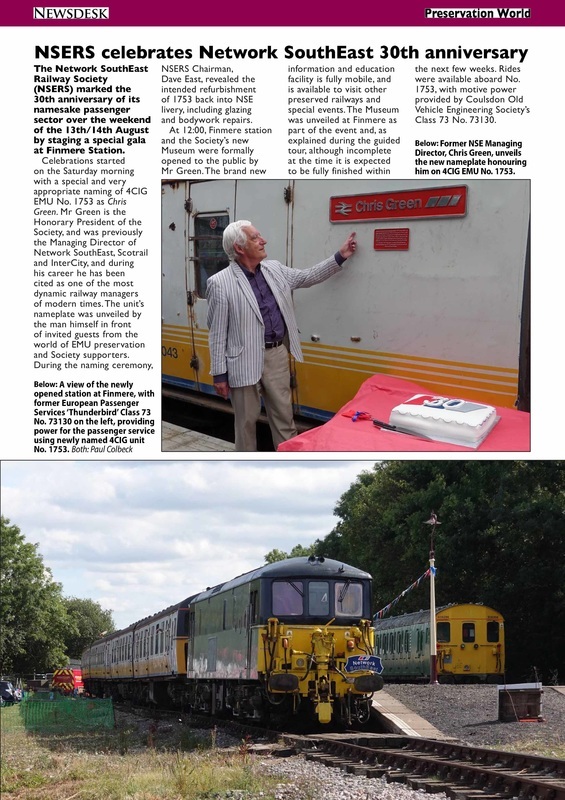 Both of the society headboads were in use, the last time in the anniversary year for the NSE 30 one, & the society is most grateful to the railway for allowing the sales stand & the headboards to visit the line. Report by Dave East . Photos by Dave East & John Piper. 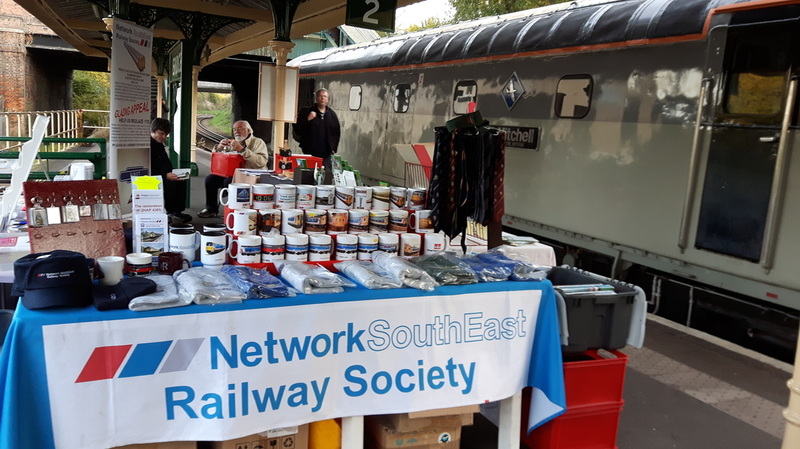 The Network SouthEast Railway Society staged a public open event over the weekend of the 12th & 13th August at Finmere Station. 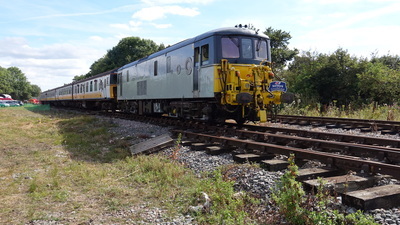 Traction was provided with their unique sole surviving Phase One 4 CIG 1753 “Chris Green” working in multiple with Coulsdon Old Vehicle Engineering Society’s class 73 130, which gave rides along a short demonstration line. 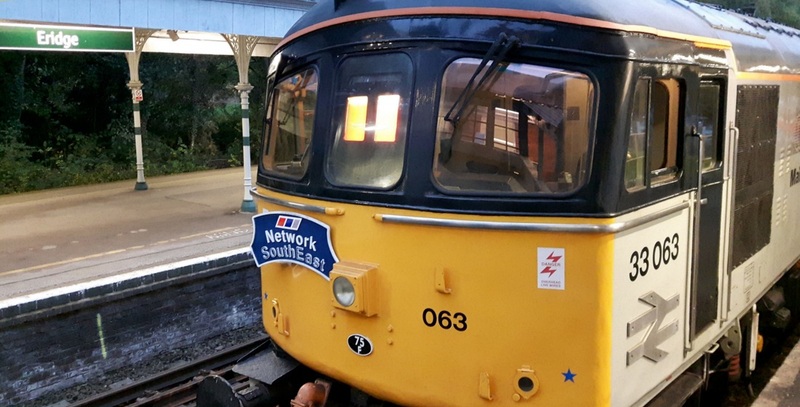 The event started with a special clearing of the new platform starting signal which was recovered from the route through Berwick on the line between Brighton and Eastbourne. A route 1753 has worked and may have stopped at in her time! 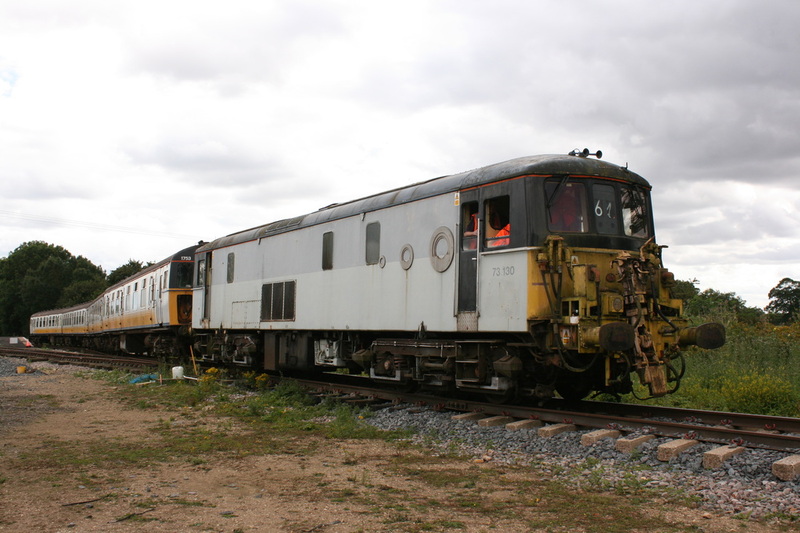 Visitors were able to inspect the now complete mobile museum that was unveiled last year and also see the work that has been undertaken to reinstate the declassified first class compartments of 1753 which include re strung luggage racks together with a replacement widow panel to replace the graffiti ones that the unit suffered towards the end of its operating carrier. Chris Green, The Society Hon. 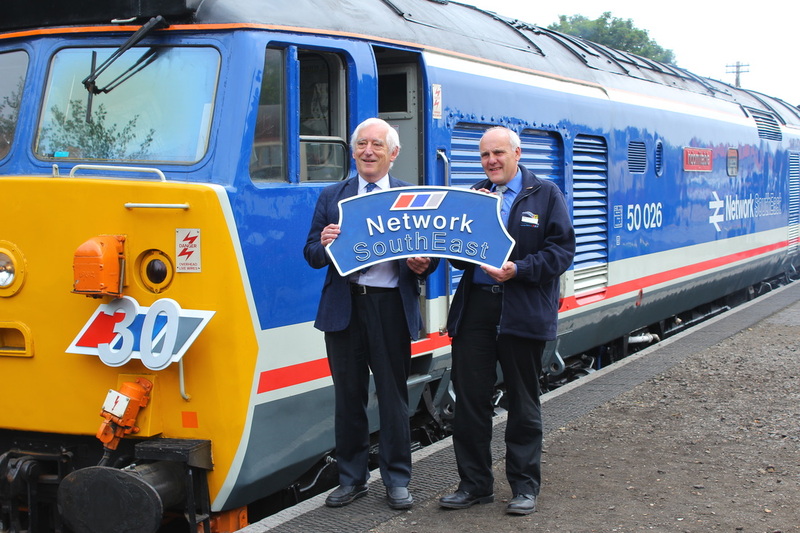 President and man behind Network SouthEast visited on the Sunday and was able to assist in some of the work before taking the controls of the train that carries his name. The whole weekend was a great success and a BIG thank you must go to all members and friends who came and help with the preparations and running the event.